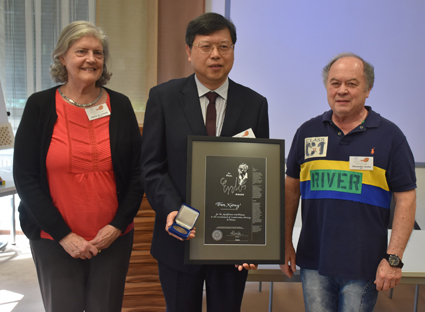 Prof. Bin Xiong was presented with his Erdos Award on 23 July 2018 at the WFNMC Conference in Graz. Below he is shown with Maria Falk de Losada (left), Chair of the Awards Committee, and Alexander Soifer, President of WFNMC. Prof. Bin XIONG of China succeeded Zhongu Qiu, a former Erdos Award winner, in the daunting task of overseeing the well-being of mathematics competitions in China. Great strides have been made in the past 20 years, and much of it is due to his effort. Starting from 2004, Prof. Xiong was responsible for organizing the national competition, the national olympiad and the selection process for the IMO team. The number of students involved is extremely large, and the amount of work is proportionally heavy. Nevertheless, he is able to meet the expectation of everyone. He is also active in many regional competitions within China. Thus he has built up a wide and very cordial network of fellow workers in this field. Over the past twenty years, Prof. Xiong has steadily encouraged and trained young teachers for participation in mathematics competitions. In this task, he has visited many parts of this vast country. His graduate students are also enthusiastic about this task, and will step into his shoes in due course. Prof. Xiong is particularly strong in his personal relation with individual students, and offers pointed assistance and advice to them. The responses from the students are uniformly positive. Thus he is the ideal choice as the leader of the Chinese IMO team, a task which he fulfilled many times. He is also very prolific in publications, and has played a leadership role in the development of competition mathematics in China. Bin XIONG was born in Shanghai in July 1963. He graduated from the Department of Mathematics of the East China Normal University in 1984 and obtained a Master of Mathematics degree from the same institution in 1991. Currently he is a professor of mathematics at the East China Normal University. His main research areas are problem solving and gifted education, with emphasis on methodology of mathematics, theory of mathematics problem solving, mathematics education, and the identification and nurturing of talented students. He has published more than 100 papers and published or edited more than 150 books, both within China and abroad. He is a council member of the Chinese Mathematical Society, an associate editor of Mathematics Teaching, and a member of the editorial boards of Bulletin of Mathematics and High-school Mathematics. Prof. Xiong has been in charge of the National High School Mathematics Competition in China since 2008. This is the first step which leads to the Chinese Mathematical Olympiad. The workload is extremely heavy since over sixty thousand students participate in the contest each year. He was invited to join the the Chinese Mathematical Olympiad Committee in 2002, and served on the Problem Subcommittee from 2005 to 2015. Dating back to 1988, he had been a trainer for the Chinese National Team for the International Mathematical Olympiad, and served as leader in 2005, 2008, 2010, 2011, 2012, 2013, 2015 and 2016. In these eight years, forty of the forty-eight team members received gold medals. He has been active in the other mathematics competitions as well. Since 1988, he has visited different regions of China in order to promote mathematics competitions. Since 2010, he has organized the annual National Research Seminar on Proposing Competition Problems. He had served several times on the Problem Subcommittees of the Mathematical Olympiad for Western China and the Chinese Mathematics Olympiad for Girls. In 2006 and 2007, he was in charge of the participation of junior high school and elementary school students of China in the International Mathematics Competition. Since 1988, he has been in charge of mathematics competitions in Shanghai for junior and senior high school students. 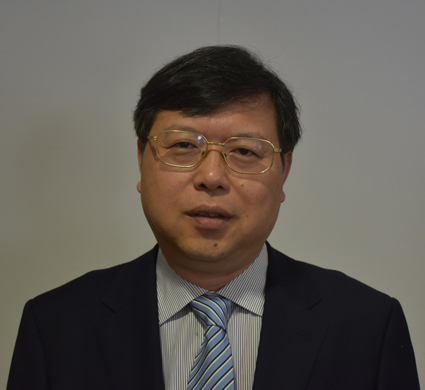 Beyond competitions, Prof. Xiong serves as the director of the Shanghai Key-point Laboratory on the Theory and Practice of Mathematics and an instructor of the Shanghai Academy for the Preparation of Key-Point Teachers. He is very active in various Shanghai programs of gifted education. Bin Xiong, Mathematical Olympiad Course, chief editor, 2000, East China Normal University Press (in Chinese). Tingyan Tian and Bin Xiong, Research on International Mathematical Olympiad, 2008, Shanghai Educational Publishing House (in Chinese). Yi Jie He and Bin Xiong, Methods and Techniques for Mathematical Olympiads, 2012, East China Normal University Press (in Chinese). Bin Xiong, Graph Theory, 2009, World Scientific Publishing Company. Peng Yee Lee and Bin Xiong, Mathematical Olympiad in China, Vol. I, 2006, Vol. 2, 2009, Vol. 3, 2013, World Scientific Publishing Company. Bin Xiong and Su Yong, Methods and Techniques for Proving Inequalites, 2016, World Scientific Publishing Company. Tingyan Tian and Bin Xiong, Studies on the Isoperimetric Inequality in Convex Polygon and Related Conclusions, Octogon Mathematical Magazine, Vol. 12, No. 2A, October 2004, pp 672–679. Simon Chua, Andy Liu and Bin Xiong, World Youth Mathematics Intercity Competition, Mathematics Competitions, Vol. 21, Number 1, 2008, pp 10–31. 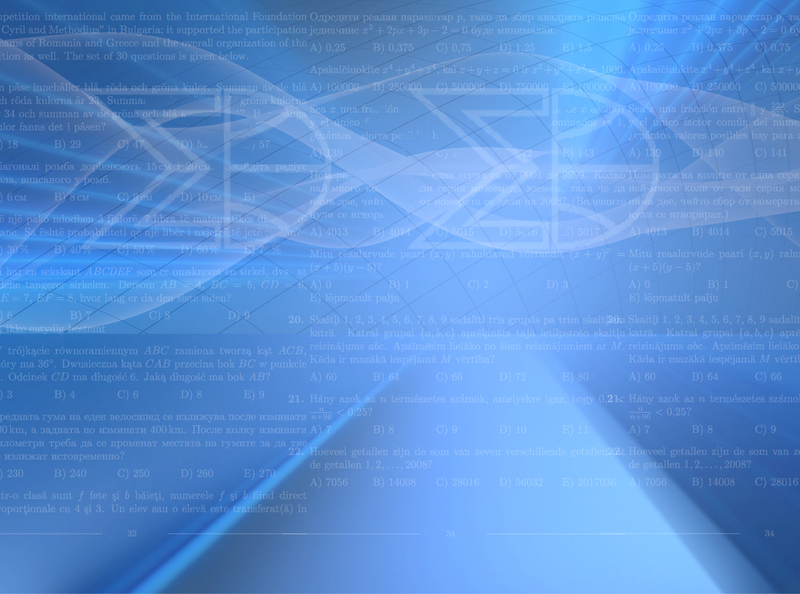 Zhigang Feng and Bin Xiong, A Brief Introduction to Mathematical Competitions in Shanghai, Asian Pacific Mathematics Newsletter, Vol. 1, No. 3, August 2011.